The lovely 16th century Saxon court gowns, made popular by Lucas Cranach, his son, and his workshop, are a study in feminine charms. They are curvy and luxurious, emphasizing the swell of the breasts, flattening the midriff, and creating gracious, flowing lines to the ground. The Saxon court gown is also one of the more complicated German styles to create, as its construction is somewhat of a mystery with no surviving garments in existence. We have only paintings, drawings, physics, and our own common sense to guide us in recreating this style. 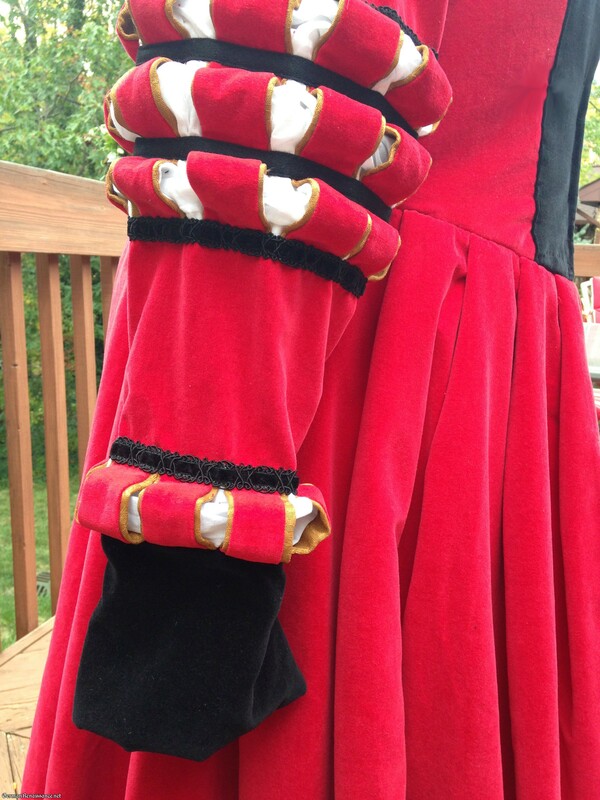 I recently created my first Saxon court gown after a fair amount rumination and research. I made it for a friend, Katayoun, who wore it to Coronation. I was working under a challenge — less than two weeks to make it and too far away to do fittings. But I’m pleased to report the gown came together without any serious hitches. She looked wonderfully German. I learned a great deal in the process which I am eager to apply to my second gown, which I will make for myself. I wish to write down all my notes, observations, and tips for myself, as well as for others who find themselves wondering how on earth to make this gown while avoiding the many pitfalls. 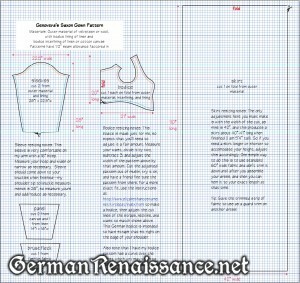 Here follows my general notes, lessons learned, and questions answered on creating a Saxon court gown. Of What Materials Were The Gowns Made? Based on the paintings, I have conjectured that the fancier gowns were almost always made of velvet. I believe that wool was also used, but probably not for the court gowns. Most gowns in this style, regardless of material, are in shades of red—this is by far the most popular color. Black and green are also seen. Blue and dark purple were not popular, if ever used at all. Gold is popular as an accent color on the guards. Note: If you opt for velvet, I recommend cotton velveteen, as I feel it looks and drapes closer to the paintings than other types of velvet. I chose red velveteen for the gown and black velveteen for the guards. The brustflecks were likely cloth of gold, brocades, velvets, and silks — the nicest fabric a person could afford. 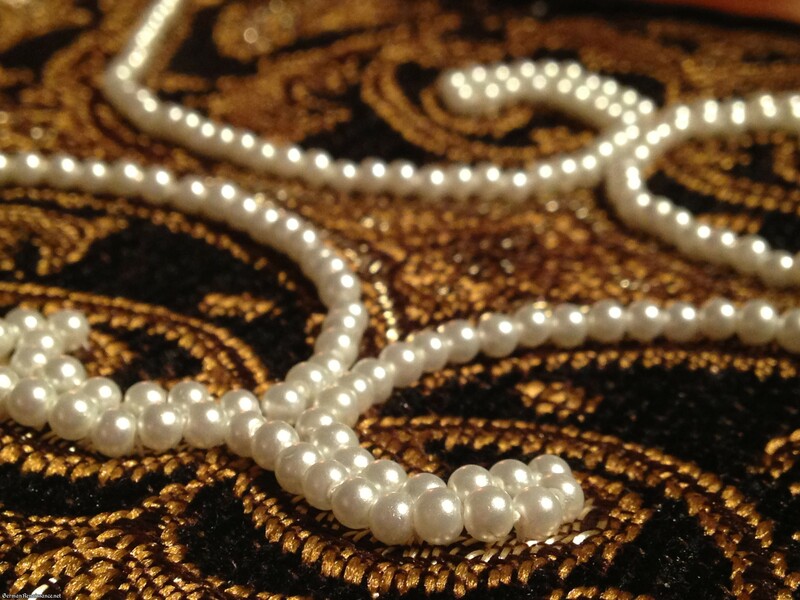 They were often adorned with pearls. 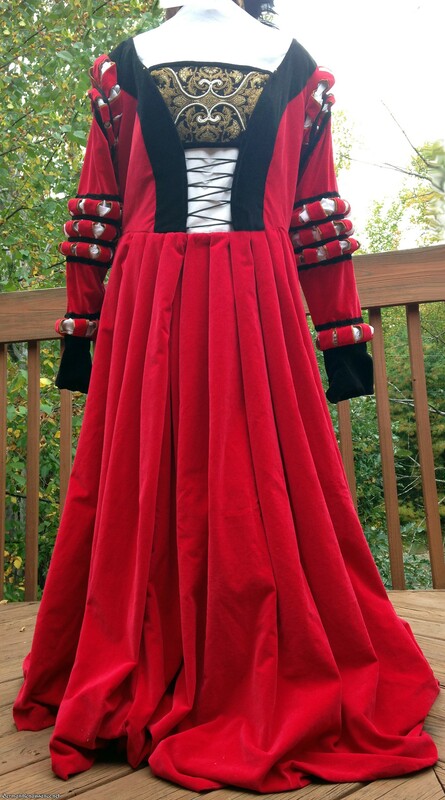 Katayoun’s gown came to me partially constructed (bodice and sleeves together, plus an unattached skirt, all in velour). I decided to take them apart and use them as a pattern to re-cut them in velveteen, so my focus was on the construction rather than the initial fit. 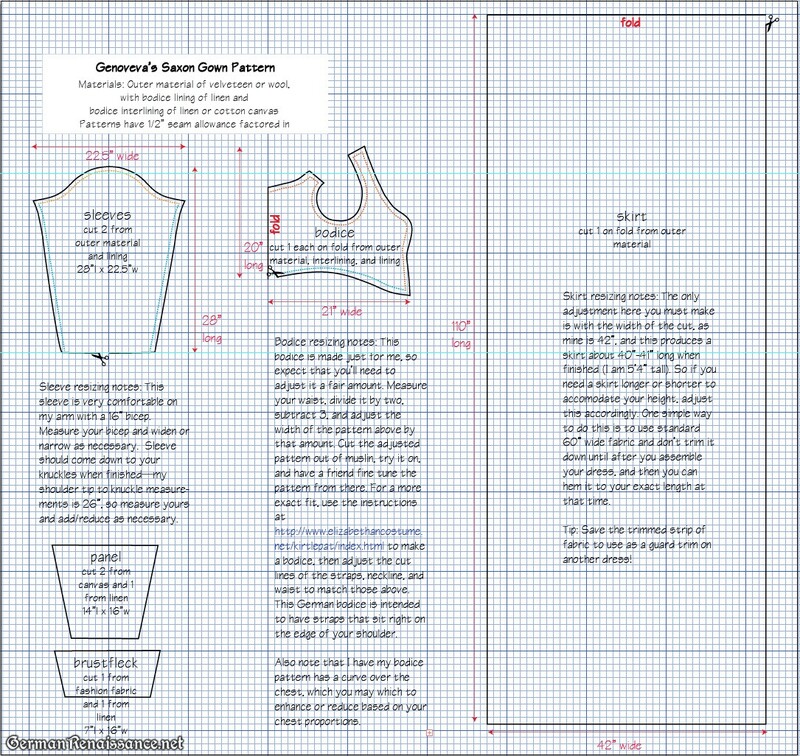 However, I have developed a pattern for myself based on my German goldwork gown, which you can resize to your figure. The key points are you’ll want to cut the front edges of your bodice short so there is a slightly graduated gap of about 5-10″ (depending what looks good for your figure) and you’ll want a curve over the breast (depth variable for your proportions) for that curvy look. The sleeve is tapered and as tight fitting as you can stand, but long (to the knuckles). The skirt is a rectangle. 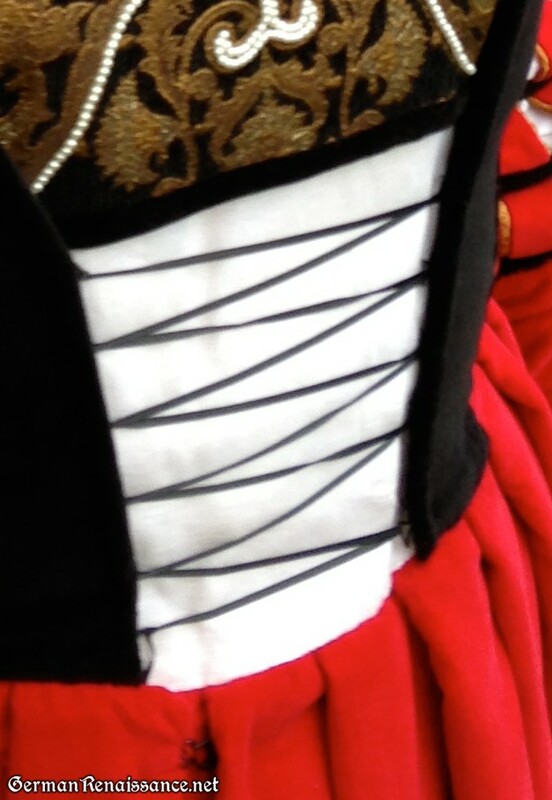 To Corset or Not To Corset? 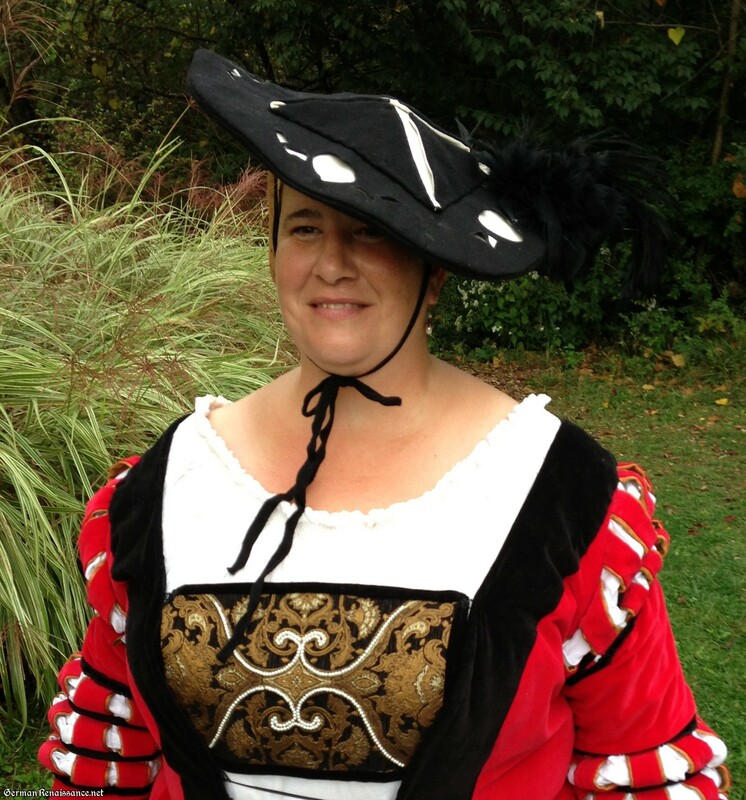 I lined the bodice with linen and canvas, the sleeves with linen, and the skirt with muslin. I think this made a huge difference in the overall look of the finished dress. I will do it again. How to Cut the Bodice Guards? I have an entire post on guard cutting. I ended up cutting the guards for this gown in two parts (bodice side and half of neckline x 2), but I think would have been better to cut three parts (bodice side x 2, neckline x 1) because the back neckline wanted to stretch too much as its curve was right on the bias. 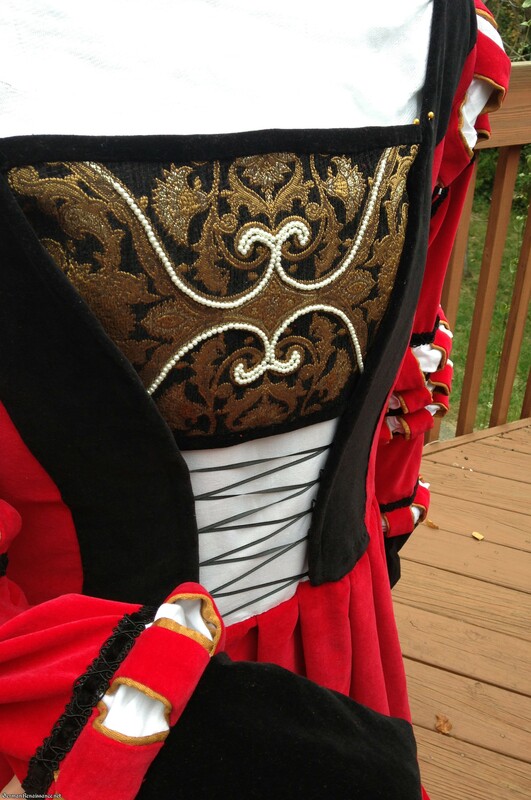 How to Keep the Bodice Guard Smooth? I was really worried about the front edge of the bodice gaping and bagging, as I’ve seen it do in some reproductions. So I edged the bodice with thick hemp cord along the inside edge, under the guard, to provide more structure when lacing, and it worked. Here is the gown laced and you can see no gaps. Definitely a winner and I’ll do this again! How to Attach the Brustfleck? This was a challenge and I did a lot of research trying to answer the question to my satisfaction. What I did was create a white panel with two pieces of canvas and a piece of linen, about 14″ long, and sew it to the waistband so it would lay under the front guards. The canvas was to stiffen it and reduce wrinkling, which worked. The decorative brustfleck was just pinned on to the top of the white panel (so it could be removed when washing the gown). 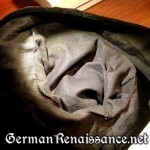 I sewed two large eyes to the top corners of the brustfleck, with two corresponding hooks on the underside of the guards. Tension kept everything in place. The only things I will change for next time are to move the eyes on the brustfleck further in so the brustfleck top corners could not be seen at all, and I think the hooks/eyes also need to be moved up a little higher so the white panel doesn’t sag down at the waistline. Otherwise, it seems to work well! How to Decorate the Brustfleck? 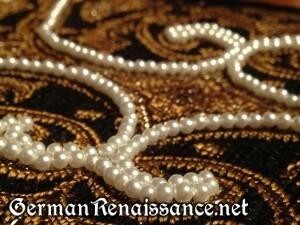 I used pearls, as most paintings depict a pearled brustfleck. I have a tutorial on how to pearl a brustfleck for a fluid, even look. How to Pleat the Skirt? Rolled pleats! They looked just like the paintings. I have an entire tutorial and calculator on how to make rolled pleats. 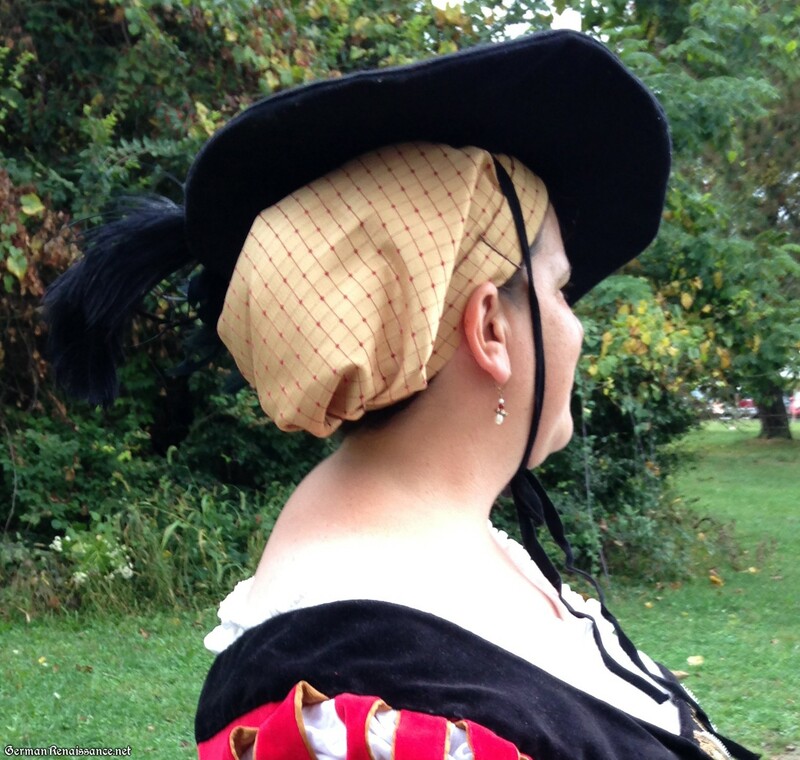 The pleats on this gown were 1.5″ wide pleats (made of 7.5″ of fabric, rolled). I attached a twill ribbon to the inside when I tacked the pleats down (by hand) to give them a little extra stability, then I sewed the pleats to the bodice, from the inside, with an overcast stitch. I tried sewing them from the outside, but the stitches were much more obvious. 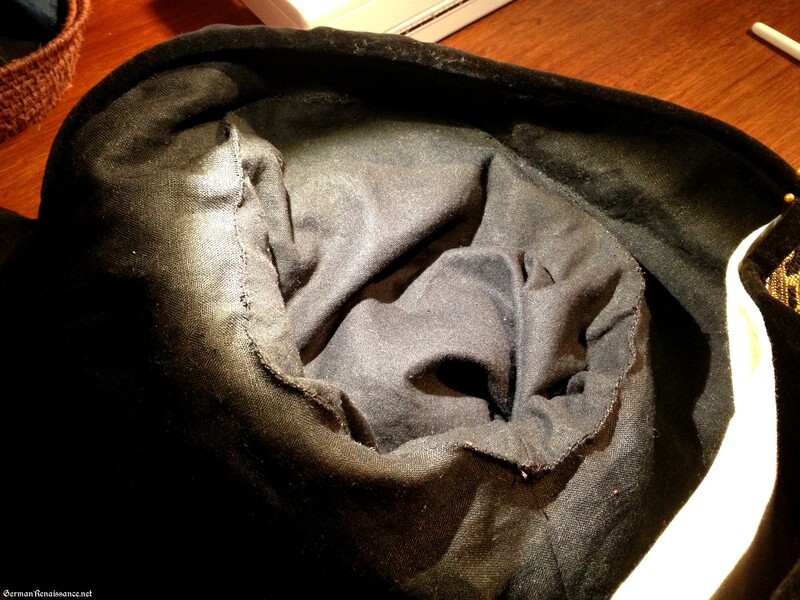 Sewing from the inside provided a smoother look. I plan to go in depth on several topics, including the brustfleck beading and sleeve paning. If there’s something else you’d like me to describe in more detail, please let me know! My thanks to Gebhard and Katayoun for talking to me about creating this gown—I was feeling challenged by this dress and this was exactly the inspiration I needed to push through it. (Please note: I do not take commissions; this was a gift for good friends who had done me a great service.) I challenge Gebhard and Katayoun to apply guards to the bottom half of the skirt, and I will show them (and you) how in a future article. Thank you! I did make Katayoun a simple haube out of a lovely gold threaded material. 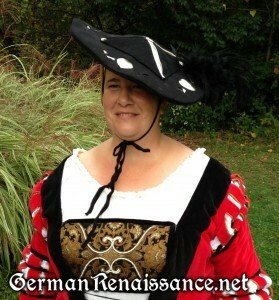 While it’s not a big fancy goldhaube like the one I made this spring, it still looked very nice. Here’s a photo of it. I will post a tutorial on the beading soon! I do not, no. Do you have a reference image you are working from?